Choosing Medicare coverage is an important decision that shouldn’t be taken lightly. The goal is to get the most benefits for the cheapest price. What are my Medicare coverage options to choose from? Original Medicare with a stand-alone Prescription Drug Plan and the option to purchase a Medicare Supplement Plan. See the pros and cons of a Medicare Supplement. 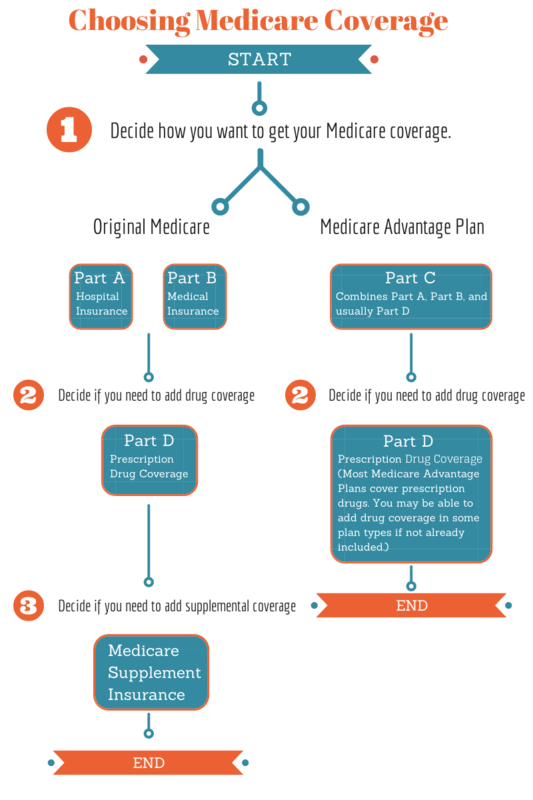 Medicare Advantage Plan (Part C) which usually includes a Prescription Drug Plan. Medicare beneficiaries need to select option 1 or 2. Individuals cannot have Medicare Supplement Insurance and a Medicare Advantage Plan at the same time. To purchase a Medicare Supplement Plan or a Medicare Advantage Plan, individuals need enroll into Medicare Part A and Part B. Use the guide below to navigate the two coverage options. Information guide on choosing Medicare coverage. Refer to the Medicare & You handbook for information about Medicare coverage. Retirement Transitions is not connected with or endorsed by the United States government or the federal Medicare program. Choosing Medicare coverage is an important decision, but not permanent. Individuals have at least one chance annually to make changes to your coverage. Individuals who enroll into Medicare Advantage (Part C), can not be sold a Medigap insurance policy. Individuals working should check with their employer or union representative to see if they offer similar coverage before enrolling into Medicare and leaving group insurance. Prescription Drug plans can be changed annually during certain enrollment periods. There are special election periods (SEPs) for individuals for special circumstances. Medicare Advantage plans can be changed annually during the “Annual Enrollment Period.” There are “special election periods” for individuals that meet special qualifications, such as moving out of a service area, individuals receiving Extra Help, on Medicaid, etc. Medicare Supplemental plans can be changed at any time. When choosing a different supplemental plan, you may have to go through underwriting.